In the way of accessories, we were sent a heat deflector and a grill expander. Kamado Joe also makes excellent pizza stones that you can see in our review of the Kamado Joe Classic cooker. First, let's take a look at the grill expander. Essentially it is a raised grid that gives you more cooking grid space and/or allows you to cook food higher up in the dome, closer to the radiant heat of the dome ceramics. Its three legs each have a small semi-circle of metal on the bottom to allow them to rest on the lower main grid. The grill expander is thus held in place so as to provide a stable cooking platform. You'll notice how the grill expander has a gap at the front to allow access to the hinged portion of the lower grid. The grill expander is approximately 19 inches in diameter and it weighs 6 pounds 9 ounces. So it is also quite substantial. In addition, we really find it quite convenient to use. All you do is set it in place and you are ready to go. 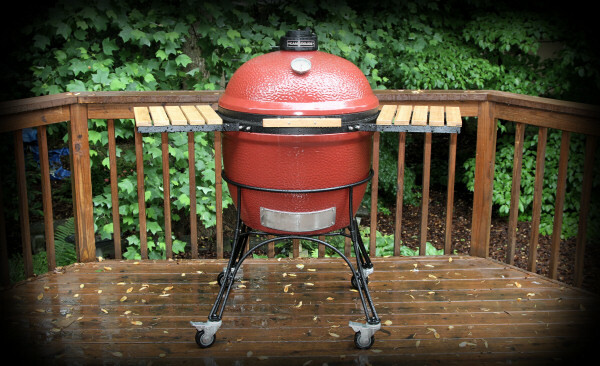 The grill expander was one of the reasons why we came to use the Kamado Joe Classic cooker so much. Now for some photos of the heat deflector in the BigJoe cooker. First, a photo of the frame in the cooker and the frame holding the cooking grid in the raised position. Next, (left) the setup for pizza or a raised indirect cook (to allow more heat and smoke to rise up to the food), (center) the setup for holding a drip pan on a low slow indirect cook, and (right) the setup for doing indirect cooks on one side of the cooker. When we placed the heat deflector into the cooker in preparation for a low and slow cook, we saw that narrow gap between the ceramic plate and the fire ring and worried if enough airflow was possible to keep the fire going. We'll describe cooking with the heat deflector a little later, but we had no trouble regulating the temperature or keeping the fire going. We also realized that with the plate setter, you have three large gaps where the meat can be exposed to direct heat, whereas with the Kamado Joe heat deflector, there was only that small gap all the way around. In essence you have more indirect cooking space. We definitely prefer this heat deflector for low and slow cooking as well as its other uses.